Proforme Kit Information, find help here to choose which kit you need. Which Automation Kit Do I Need ? 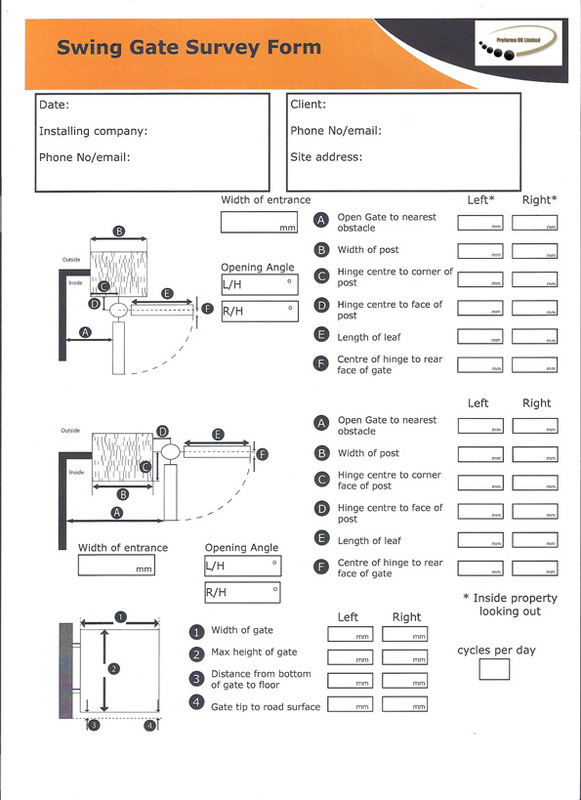 If you are new to automation it is very easy to get confused over which kit you should be looking at in regards to the gates in question and the site to be automated. If you read through this page and still have questions or are unsure as to which kit is right for you, please call us on 08443 570211 and someone will gladly help you. Hydraulic kits are usually used for Commercial installations where the gates are going to be under a high work load all day long. They are also used on very heavy gates (leaf weights of more than 300kg). The main thing to think of when buying hydraulic gate automation kits is that most motors are not self locking, so make sure when you are ordering you either ask for a self locking kit, or a seperate lock for your gates. Electromechanical kits are more suited to domestic installations as they tend to cheaper than hydraulic kits and are more than capable of coping with the weight and work load of a domestic gate. These days electromechanical kits are just as reliable as hydraulic and almost as powerful in some cases. Make sure that your electromechanical kit has machined gears and not cheap cast gears as cast gears will shear under the pressure of the wind. You can get greased or oil filled electromechanical motors. Oil filled motors are quieter and have a longer life. Electromechanical motors are available in both 240v and 24v. The 24v motors provide greater safety as the power supply at the motor is low voltage. Both systems are still supplied at the control panel by mains 240v. The 240v motors have more power than 24v motors but the 24v motors have a higher duty cycle. So now that you know the difference between electromechanical and hydraulic kits, what type of kit do you need. Will it be above ground or underground. Will you need any extra accessories not included in the kit and will it fit your gates. These are the most popular and best selling kits of all, contrary to popular belief these kits are actually one of the most reliable. As these kits are sunk into the ground they are designed to be capable of running under water, this said you will still need to have a soak away dug in next to your foundation box to allow water to drain away, as the seals will not hold out water when a motor is submerged for any period of time. Water can not get into the motors under normal circumstances when the foundation boxes are properly drained. Underground kits are popular due to the fact that when fitted you will not be able to see them and they will not spoil the look of your new gates. An underground kit will take approx 1 day more to fit than a kit fitted above ground but are well worth the extra effort and cost. It does not matter how big your pillars are. It does not matter if your gate opens up against a wall with no room between the two. It does not matter if you need your gates to open outwards. It does not matter if you need to mount your motors on the back of your pillars. These motors can be more effective in windy situations than other motors. They can only be fitted to small posts (usually steel box section or wooden) without having to recess them into the post itself. The Ram Arm fits onto the gate itself on the inside of the gate, they can be fitted either at the top, bottom or most common in the middle of the gates. Once fitted the motors are visable to everyone from the inside of the gates. 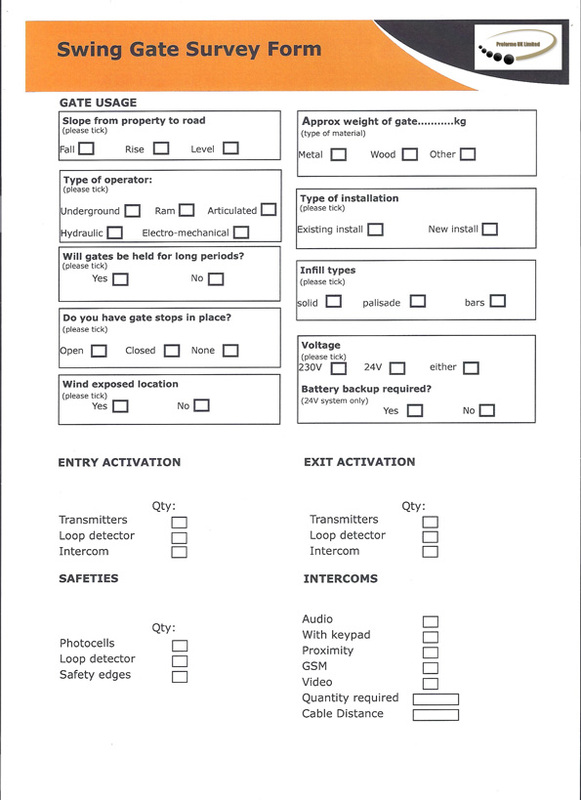 Automation Swing Gate Survey Form. If you are not sure which kit you will need download the survey form below and return to us complete, we can then advise you on which kit would best suit your needs.